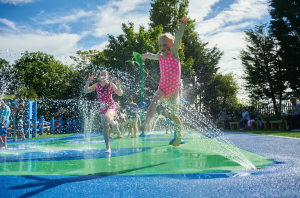 Zero-depth splash pads can offer holiday parks the ‘wow’ factor and can provide the ideal tool for attracting and retaining guests. Come rain or shine, water play provides hours of fun for bathers of all ages. From thrilling head-to-toe splashes to gentle sprays and fine mists, aquatic play features go a long way in enhancing the guest experience at holiday parks. Through smart design and a good selection of features, any holiday park can create an aquatic play space that guests will enjoy and want to return to on repeat visits. However, holiday park pool operators, like others in the commercial sector, are facing increasing pressure to demonstrate energy efficiency, as well as reigning in the cost of upkeep and maintenance to see the maximum return on investment. “A perfect holiday park pool is a safe pool, a fun pool, and an inclusive pool – something for the entire family,” reveals Craig Valentine, Health & Safety Support Manager at Bourne Leisure. “In the past we went with high energy activities such as fast water slides, but the thinking has now changed as we adapt to the restraints of children staying in school. We always look to make our pools as family friendly as possible so that we can cater for smaller children and make sure they also have a fun time.” Craig oversees the leisure teams at each of Bourne Leisure’s 55 sites. His main expertise is in swimming pool safety, encompassing the group’s 122 swimming pools, spas and water play areas. “The most prominent challenge facing the industry at present is keeping the pools clean and free from any nasty bugs. Cryptosporidium awareness is very big at the moment and the challenge is keeping this out of our pools by keeping our filtration systems in tip top shape,” says Craig. Craig reveals that many holiday parks do not have a designated pool maintenance team in place, due to cost and work challenges. Bourne Leisure has a list of approved pool contractors in place across the country that can be called upon when things go wrong, thus ensuring a fast turnaround on repairs and maintenance. To read more on this story, please Subscribe Online Today.